The Perplexing Pineapple: The Cryptic Casebook of Coco Carlomagno (and Alberta) Bk 1 is a junior novel written by Ursula Dubosarsky, illustrated by Terry Denton and published by Allen and Unwin (2013). Kids love solving puzzles and there are plenty in this enjoyable detective story for children aged 6-8. You can see a sample puzzle in an activity sheet at the Allen and Unwin website. Dubosarsky also brings us quirky characters and a wacky story guaranteed to make kids laugh and ask for more. I loved learning facts like the one about bank robbers commonly speaking guinea-pig latin! There are lots of black and white cartoon-style sketches by Denton to add even more fun to the guinea pig capers, and break up the text for kids who may be daunted by a longer chapter book. There's a glossary of Spanish words to help young readers, too. 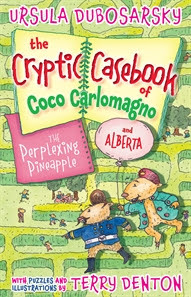 Also available as an e-book, The Perplexing Pineapple: The Cryptic Casebook of Coco Carlomagno (and Alberta) Bk 1 makes a mouthful of a title, and an excellent choice for homes and libraries where kids appreciate mysteries, puzzles and a fun, fast read.